While living in Vancouver BC in the early seventies, I learned how to make stained glass windows and hangings and began selling art. I discovered mask making in San Francisco in the late eighties. They were well received and I ended up making over 100 masks! Moving to Chicago in the nineties opened up many creative avenues including ceramic sculpture and bead making. 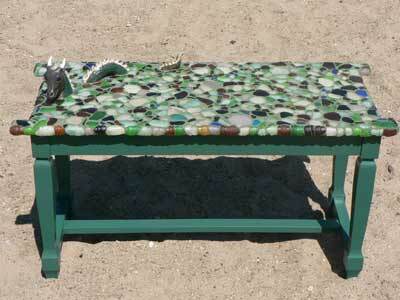 These days I have melded my love of glass and ceramics into mosaic sea tables at my studio in Roberts Creek BC. My hope is that as you view my art, you feel you have seen something unique as well as humorous.